Having spent years living in Madrid both Lynsey and Paul wanted to embrace the sunshine and Spanish culture, and to celebrate with all their closest friends and family, so decided to have their wedding in Spain. They knew their guests would love the sunshine coast of the Costa del Sol but they also wanted to have a private wedding in a Spanish villa wedding venue set in gardens where they would have complete exclusivity & privacy. They searched for a wedding venue in Marbella, an ideal setting and a great location for their guests to enjoy the celebrations and to have a holiday. Once they had found their perfect Spanish villa wedding venue they knew their day would be exactly how they envisaged and the wedding villa venue in Marbella was perfect for them. When they visited the Sunshine Weddings Spain team for the second time, they confirmed their intentions by booking the Wedding Villa in Marbella located just 5 minutes travelling time to Puerto Banus. With a Scottish theme used throughout Paul chose to offer Lynsey’s his hand in marriage by wearing a kilt in the September sunshine. Lynsey looking fantastic and enjoyed her procession to the highland bagpipes. Guests were entertained throughout the ceremony which set the tone for the rest of this relaxed weekend in their chosen Spanish villa wedding venue. Guests mingled in the courtyard of the Spanish villa wedding venue and enjoyed a choice of 15 hot and cold Andalusian style canapés whilst Lynsey and Paul were taken, by photographer David Toms, to enjoy beach front photos for their special wedding in Spain. 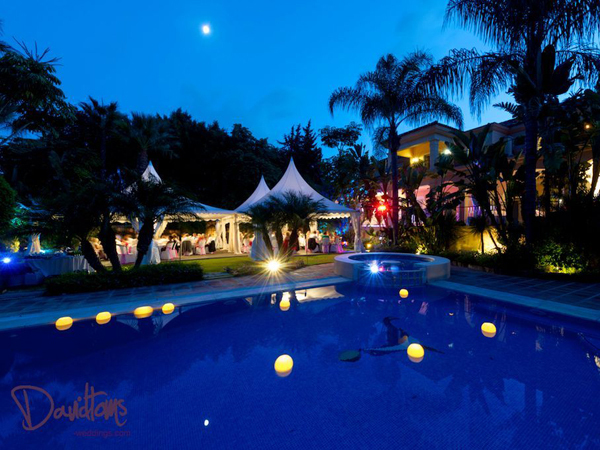 Upon returning to their wedding venue villa in Marbella everyone was greeted by a magical setting with candles floating in the pool and set around the gardens and they enjoyed a Spanish 3 course feast over looking the golf course. Once the speeches had been made a flamenco band performed to the delight of guests, and some guests even joined in with the dancing in true Spanish style. A DJ played packing the dance all night long, and to offer a helping hand in keeping everyones energy levels up a midnight feast was served. The last of the party goers stayed by the pool till sunrise and a great night was enjoyed by the Scottish meeting the Spanish contingent of Madrid, making this Spanish villa wedding venue option very popular for all of the guests to enjoy Lynsey & Paul’s very special wedding in Spain.